Christmas means many things to many people: the Christmas Season brings a bounty of choral singing that serves up the many joyful and festive feelings that celebrate the day. 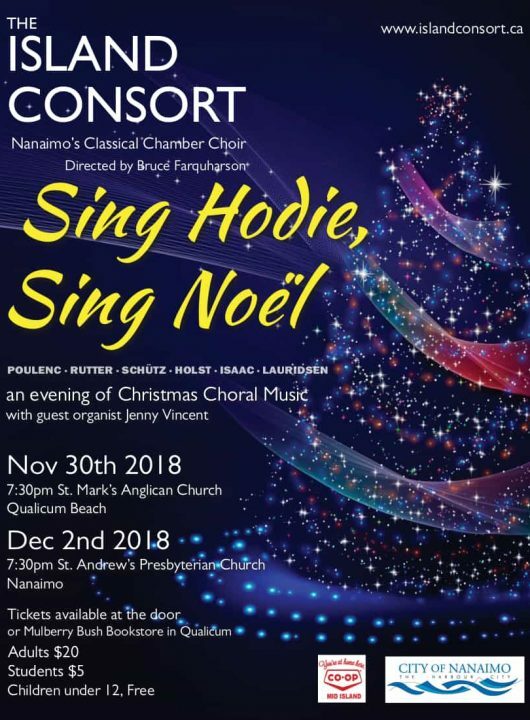 In that spirit, the Island Consort – directed by Bruce Farquharson – performs a program of works that represents Christmas music from Renaissance time to the current time, in a program titled, “Sing Hodie, Sing Noel”. This chamber choir has honed its skills to a high level of performance and is guaranteed to deliver the essence of Christmas in song. With occasional organ accompaniment by Jenny Vincent, the choir begins with Isaac’s 16th century, Puer Natus Est Nobis (A Boy is Born to Us) followed by Schutz’s Meine Seele Erhebt den Herren (My Soul doth Magnify the Lord). Then follows Gustav Holst’s This Have I Done for My True Love, Don MacDonald’s Ave Maris Stella, and Lauridsen’s O Nata Lux. The first half ends with Poulenc’s sparkling, Quatre Motets pour Noel. Javier Busto’s Hodie, Christus Natus Est launches the 2nd half followed by a couple of traditional carols; Ola Gjeilo’s inventive arrangement of The Holly and the Ivy and a unique rendition of In the Bleak Midwinter, combining arrangements by Gustav Holst and William Llewellyn. Our Romanian alto, Monica Morosan contributed a much beloved carol from her country, O, Ce Veste Minunată (O, How Wondrous News) which will be sung in Romanian. The concert finishes with two organ-accompanied pieces; John Rutter’s lovely Nativity Carol and Gustav Holst’s medley of English carols, Christmas Day.